You are welcome to visit Upton Warren with a group but to ensure that you have a visit that isn't compromised by scheduled work, education activities or other group visits, please contact Eleanor (01905 754919) to book your date. Day permits cost £3 each for non-members. Worcestershire’s premier bird-watching reserve, Upton Warren attracts birds throughout the year. Worcestershire’s premier bird-watching reserve, Upton Warren attracts a range of birds but is particularly good for waterfowl and waders. The reserve consists of a series of freshwater and saline pools, created by land subsidence resulting from local brine extraction. Not only do these attract a wide variety of birds but the saline pools are an important inland site for saltmarsh plants. The 26 hectares reserve is split into two distinct areas; the Moors and the Flashes. The freshwater Moors Pools form the northern part of the reserve and the saline pools of the Flashes form the southern part. There are numerous hides looking out over both parts of the reserve. As well as attracting a range of wildfowl they’re also home to breeding avocet, common tern, black-headed gull, oystercatcher and redshank. The reeds and surrounding vegetation support populations of reed, sedge and Cetti’s warblers and reed bunting. Upton Warren is a place you’ll want to return to throughout the year. Spring and autumn passage often brings marsh harrier, osprey and black tern. Spring and autumn also bring green and common sandpiper, ringed plover, dunlin, greenshank and black-tailed godwit. Scarcer species have included ruff, sanderling, turnstone, bar-tailed godwit, whimbrel, wood sandpiper, spotted redshank, little stint and curlew sandpiper. Past records have included least sandpiper, Wilson’s phalarope, red-necked phalarope, black-winged stilt, Sabine's gull, laughing gull and pectoral sandpiper. Avocet, little ringed plover and lapwing young are around throughout summer and the black-headed gull roost increases in size from late summer. The reserve often hosts Mediterranean and little gull too. Winter brings bittern, water rail, common snipe and jack snipe. Summer is also great for insects; ruddy darter frequents the pools along with southern and brown hawker dragonflies. Banded demoiselles and blue tailed damselflies skim the surface of the pools. Much of the land was generously purchased by Christopher Cadbury who also helped to pay for many developments and improvements. The reserve now bears his name as a small token of our recognition and appreciated of his work. Please note that visiting Wildlife Trust members must carry their membership cards and non-members must obtain a permit (£3) from the Trust offices at Smite, onsite volunteers, the Outdoor Education Centre or in advance from Worcestershire Wildlife Trust by email or post. Any member without their membership card will be charged for a £3 permit. This is one of 13 flagship reserves.We believe that a landscape-scale approach to wildlife conservation is essential. Wildlife needs space to adapt and move to cope with the consequences of climate change. Practically, this means that to deliver our biodiversity vision, we need to develop a coherent network of large areas linked by corridors that can provide benefits for people as well as for biodiversity. 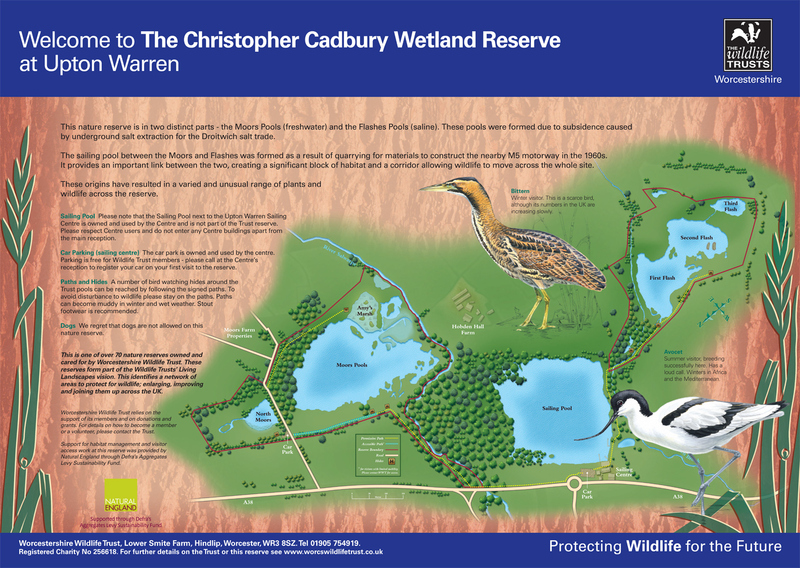 Why is The Christopher Cadbury Wetland Reserve at Upton Warren a Flagship Reserve? This is an important site which is extremely popular with birdwatchers, it has a complex hydrology and the pools all owe their existence to past underground brine extraction which has caused subsidence and consequent flooding. The Moors Pool is a shallow freshwater lake. The Flashes are saline and salt tolerant plants form a unique inland salt marsh. This makes it an ideal site to show effective wetland management integrated with public access. The nature reserve buffers the Forest of Feckenham Living Landscape area and is an important link between the Droitwich Canal wetlands, the Birmingham and Worcester Canal, the river Salwarpe and the river Severn. The reserve is open dawn-dusk but please note parking restrictions at The Flashes (below). Wildlife Trust members must carry their membership cards and non-members must obtain a permit (£3) from the Trust offices at Smite (in person, by email or post), onsite volunteers or the Boatshack Cafe. Members without their membership card will be charged for a £3 permit. Wheelchair access to 2 hides at The Moors along stoned track via a padlocked barrier. Please contact Trust for access through barrier. We regret that there is no wheelchair access to The Flashes. Please use paths and hides provided; straying from these can disturb the birds. Boardwalk sections, bridges & paths can be muddy & slippery when wet. The Flashes - Apr-Sep 9am-8pm; Oct-Mar 9am-4pm - Gates will be locked at all other times, do not park elsewhere, pedestrian access through the Aztec Adventure car park is available at all times. The Moors car park is open at all times.